The Marketplace Fairness Act currently being discussed this week in the U.S. Senate is causing quite a kerfuffle, as heavy hitters continue to line up on either side of the debate. The act endeavors to turn on its head a 1992 Supreme Court decision that exempts catalog and online retailers from collecting state and local sales taxes as long as they don’t maintain a physical presence in the particular state from which a purchase is being made. On one side, President Barack Obama is for it, as are state and local leaders, as well as the National Retail Federation. Even Amazon supports the measure. On the other side are eBay and anti-tax groups like the Americans for Tax Reform. Also on the nay side are two big financial industry groups: The Financial Services Roundtable, and the Securities and Financial Markets Association, both of which are imploring senators to slow down and consider how this legislation would affect banks and other financial institutions. It’s easy to see why eBay is concerned, and why big-box retailers would like to see the measure pass. The financial sector’s interest is less transparent, but stems from a fear of what might follow in the footsteps of an Internet sales tax law — namely, a tax on online stock transactions. The FSR’s membership is comprised of banks, insurers, and finance companies, while securities firms, asset managers — and banks — grace the membership directory of SIFMA. 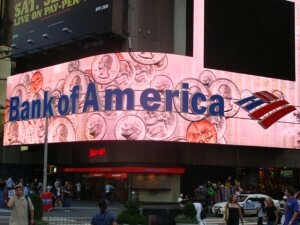 Not surprisingly, the interests of Bank of America Corp (NYSE:BAC), Citigroup Inc. (NYSE:C), JPMorgan Chase & Co. (NYSE:JPM), and Wells Fargo & Co (NYSE:WFC) are represented by both groups. Why does giving state and local governments the ability to collect sales taxes from online companies scare the likes of banks and asset managers? Two reasons: 11 European countries are planning to implement such a tax in the near future, and a domestic version has been crafted by Sens. Tom Harkin, Sheldon Whitehouse, and Rep. Peter DeFazio. The U.S. bill would levy a tax of $0.03 for every non-consumer financial trade of $100, and would have its greatest effect on high-speed trading, according to The Nation. While the status of that bill is unclear, Treasury Secretary Jack Lew has stated publicly that the current administration is against a financial transactions tax. The fear regarding the online sales tax law is that it might create a slippery slope whereby taxation of any type of Internet-based transaction would be possible. As the chief lobbyist for the FSR notes, passage of this legislation “creates the impetus” to levy a tax on stock transactions made via the Internet. As long as the Obama Administration opposes it, it seems unlikely that there will be a push to enact such a law. But financial sector lobbyists aren’t taking any chances. And, with all the ears to which these industry lobbyists have access, it’s probably not going to be an issue any time soon. The article Why Wall Street Fears the Internet Sales Tax originally appeared on Fool.com and is written by Amanda Alix. Fool contributor Amanda Alix has no position in any stocks mentioned. The Motley Fool recommends Amazon.com, eBay, and Wells Fargo. The Motley Fool owns shares of Amazon.com, Bank of America, Citigroup, eBay, JPMorgan Chase, and Wells Fargo.